Berwick Horse Procession and May Fair, 1911. As you're reading this, you probably have Scottish ancestry or family members in Scotland. If you have ancestors that lived on the English side of the Border with Scotland, it's quite likely that you had family members that lived or worked in the Scottish Borders, or possibly just got married in Scotland or on one of the bridges over the River Tweed; the bridge between Cornhill and Coldstream was famous for such marriages. My thanks to Marjorie Gavin for spotting that you can get 20 free credits on ScotlandsPeople worth £4.50 with an offer valid until 30 April. Register at ScotlandsPeople if you are a new user, or log in, if you already have an account. When you're logged in, click on 'Buy more credits' at the top of the page on the right. You will be taken to a page where you should enter the promotional code. You should then receive 20 free credits worth £4.50. Have you a Wicked Criminal in Your Family ? 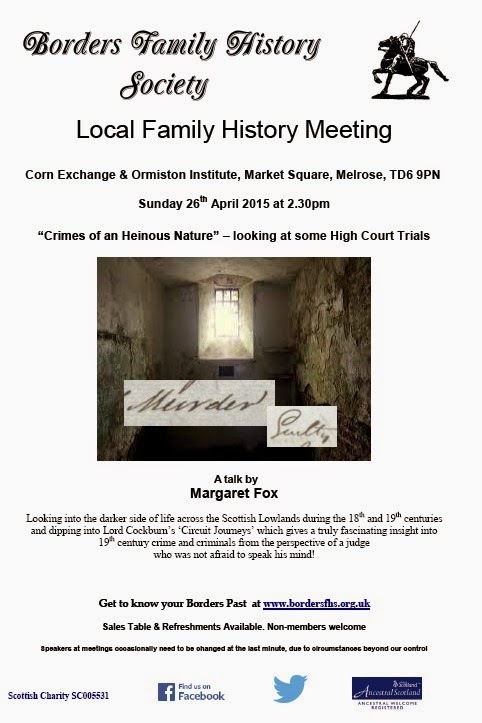 Our next talk is on Sunday, 26th April when Margaret Fox will talk about "Crimes of an Heinous Nature - Looking at some High Court Trials" and it's being held at the Corn Exchange & Ormiston Institute in Market Square, Melrose. Map. Margaret will be looking into the darker side of life across the Scottish Borders during the 18th and 19th centuries, examining not only crimes which have long passed into oblivion but also those which are still making the headlines today. Drawing on her extensive research in the High Court of Justiciary case papers in the National Records of Scotland, her talk will range from the political to the domestic, and from the violent to the less so, showing how these records serve to illustrate changes in society and illuminate the past in a unique way. She will also dip into Lord Cockburn’s ‘Circuit Journeys’ which gives a truly fascinating insight into 19th century crime and criminals from the perspective of a judge who was not afraid to speak his mind ! Her previous talks about the Kirk and its records, and about Traquair House were well attended so come early to get a decent seat. To mark the Who Do You Think You Are Live show in Birmingham, England; Ancestry is providing free access to its English Midlands Collection. Don't delay, the offer ends on Saturday, 18th April ! 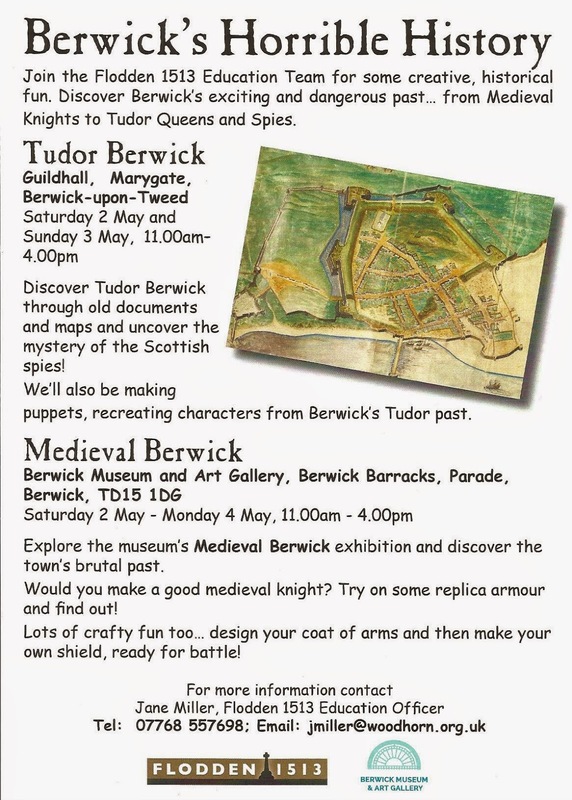 This weekend is the start of the Berwick 900 Festival that celebrates 900 years of Berwick’s history. The theme of the Easter weekend, 3rd to 6th April is “Our Christian Story” that celebrates Christian institutions, religious life and a few of the great Christian leaders in the town. At St Andrews Church, Wallace Green, Berwick-upon-Tweed, TD15 1ED as well as the “Moments in Time” Flower Festival, inspired by the church’s history, there will be display panels about Robert Balmer, an inspirational minister at Golden Square, Dr John Cairns and Berwick’s well known physician, Philip MacLagan, a church elder. Although all these men were born in Scotland and at times lived elsewhere, they all had strong links with Berwick. Like them, John Hamilton Hall, a freeman, was born in Coldstream, moved to Berwick as a child where his father was a doctor, left the town to fight in India, returned when he retired from the army, aged 40, got married and then moved to Edinburgh. Did your family move into or out of Berwick ? 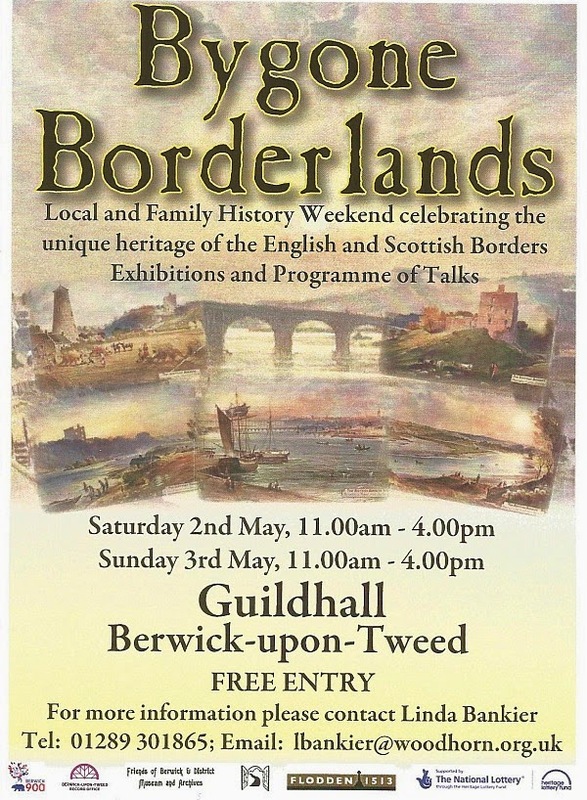 If your family is associated with Berwick, Tweedmouth or Spittal, the Berwick 900 Our Families Project would love to hear your family stories. Tweet them @Berwick900 or contact Linda Bankier at berwickarchives@woodhorn.org.uk . Normally you need to visit Berwick Record Office to consult the transcripts of church registers of baptisms, marriages and burials for Berwick and Tweedmouth. However, over the Easter weekend, you can look at some of the registers in the churches where the events took place – Berwick Parish, St Andrews and Berwick Roman Catholic churches and Tweedmouth Parish Church. Look on the Berwick 900 website for opening times. Are you wondering how to start your family history ? Perhaps you’ve started researching your family but have hit a brick wall. 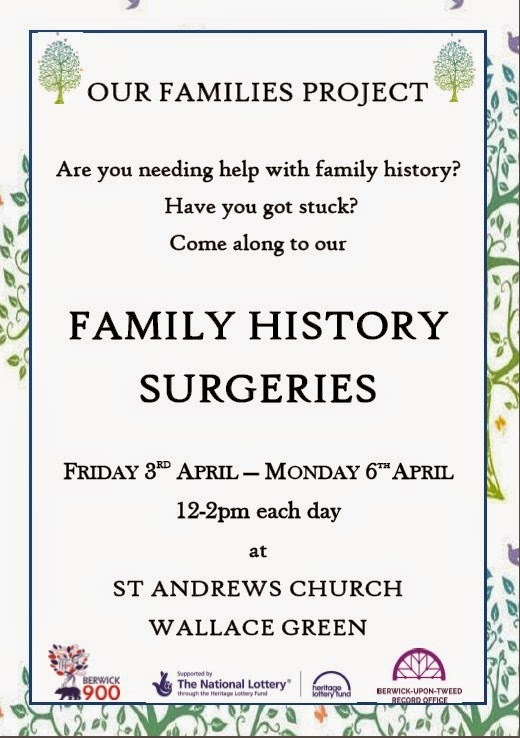 If you need some help, go along to the Family History surgeries in St Andrews Church from 12 to 2pm each day from Good Friday to Easter Monday and speak to experienced genealogists.